Librarian in Training: Have an Appy Christmas! Because I am the master of procrastination I have spent the last few weeks experimenting with creating an interactive Advent calendar to showcase a number of apps that I've found useful. Just click on the window for that day - no cheating and looking ahead!- to see the featured app. It's a small bit of silliness for Christmas (but that's what it's all about at this time of year isn't it?). 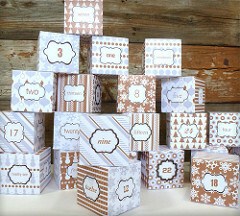 The Appy Advent Calendar can be found here.